and high speed lan venom. We won’t forget you, Toyah! Thunder in the Mountains video, wasn’t it? Toyah crossed with Flock Of Seagulls? What was wrong with the old afterword? She seems to be extremely suspicious of her own hairdo. I can’t blame her. When I was a young boy, working with awesome computers always looked something like this. It’s one of those pictures where different people see different things. 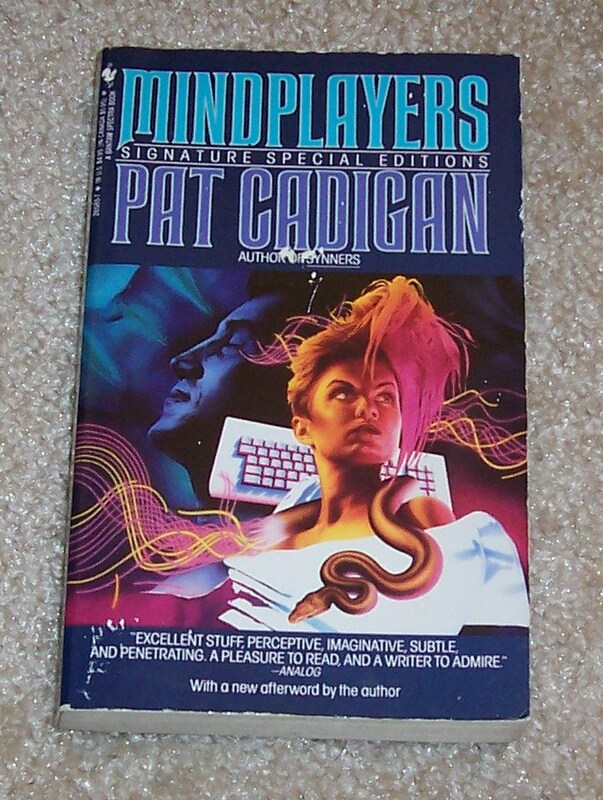 In this case, some see a woman with improbable hair, fiber-optic snake, keyboard, and superimposed profile, while other see an woman with 80’s hair being attacked by a headcrab, fiber-optic snake, keyboard, and superimposed profile. Aw, I always really liked this cover and consider it superior to the original cover on the first edition. But I guess one person’s cover art, like one person’s theology or politics, is another person’s belly-laugh. PS: What was wrong with the old afterword was, it didn’t exist. More evidence for my thesis that ridiculous hair and 80’s computers go together like peanut butter and chocolate! What is that in the upper left corner? An azure abdomen with three indigo incision scars? This cover however is just another “generic 80’s cyberpunk” and the story is anything but that (it’s damned good actually). What? Seven years and no “author in the comments” tag? There he is, up at #11…. A thousand pardons I beg, and abject apologies to Ms. Cadigan…. @Hammy: And Ms. Cadigan is a delightful, wickedly funny person. She MC’d the Hugos a few years back and I was lucky enough to talk to her at some length this year at Worldcon. She says the one deadline she’s pleased to have missed was the one the doctors gave her that she wouldn’t see 2014. As are we all. Last I saw, her actual hair was curly and a light purple. It’s good to know that Ms. Cadigan has a sensible outlook on life. Most days I feel out-of-my-depth here at GSS – nowhere near as funny, sardonic, or even (dare I say it?) erudite as the other posters here. I’ll keep trying, though…. @Hammy: you and me both. It’s reassuring to know that Imposter Syndrome exists on GSS.GSS! @Hammy – Don’t worry. Most of the “funny, sardonic, erudite” comments here still follow Sturgeon’s Law. @TW: I’ve never been so insulted in all my born days! Oh, wait – yeah, I have, actually. Quite a few times. As you were. @Hammy: Your comments are usually at minimum slightly amusing, which is what we’re all here for. I have to go for pedantic erudite b/c by the time I get to a new cover, everyone else has already taken the low-hanging fruit of obvious jokes, comments, and filk. Ms. Cadigan opened our conversation with “So how the hell are ya?” as if we’d been friends for ever, even though she doesn’t actually know me.